For me, Autumn resembles being cosy and snuggly and getting prepared for the run up to Christmas. Whether that is late night shopping, or sipping pumpkin lattes, you always want somewhere warm and comfortable to bed down in come the evening. 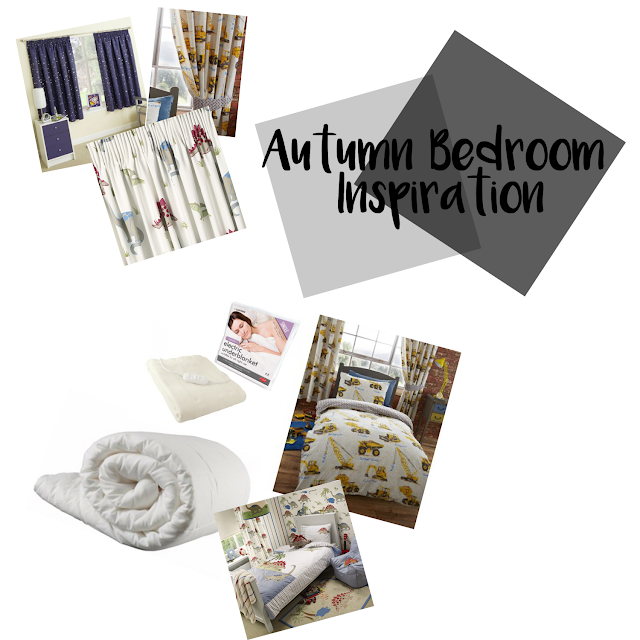 And that's why we've posted a couple of our favourite collections and ideas we've seen to prepare yours or your childrens bedroom, for that cold snap coming our way. 1. Firstly. thermal curtains. Yes, I hadn't heard much about them either, but they sound amazing, almost like the heavier tog of the curtain world. They're specifically designed to keep heat in and prevent drafts, and as all the beds in our house our right next to windows, it makes complete sense to have some. After all, who wants to wake with a stiff neck in the morning from cold creeping in? 2. Electric Blankets, have you got yours yet? Tesco have a really affordable variety for whichever bed size you're after, so we made sure we grabbed a couple this time last year. They're a must have in our household for winter, no more grimacing as you climb into bed at night. You know when you sit in someones seat and say 'Ohhh, nice and warm' yes, well that's electric blankets for you, and I'd not be without one this Autumn Winter. 3. For me it's essential to switch to a heavier tog duvet come Autumn Winter, the lighter duvets just don't cut it and lets face it, who wants to wake up shivering in the night? Although you can get all weather duvets, I just don't think they're as good as separate Summer and Winter ones. And with a new duvet, why not a new cover? I fell in love with the Dinosaur design pictured above from Laura Ashley, they're elegant but I know Noah would adore them just as much as me. 4. A little make over. People often spruce up their bedroom as part of a spring clean. But I like the idea of making it that little bit more cosy for Autumn, especially as the nights get darker and the cold creeps in, it's always nice to create that haven in the bedroom. We found Dunelm had a huge new selection online again this Autumn / Winter, so we'll definitely be having a look in store this week. I am in love with these Moonlight curtains from Yorkshire Linen, they're adorable as well as being super practical and blackout, you can find a cute display of kids curtains available on Yorkshire Linen. Do you make any changes to your children's bedroom as the nights get colder?